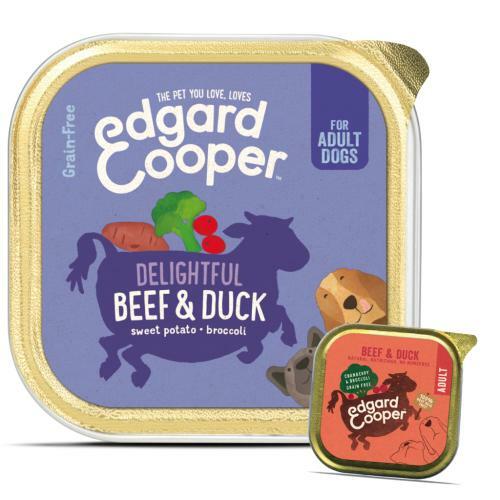 EdgardCooper Beef & Duck Grain Free Wet Adult Dog Food is a delicious recipe made using the finest deboned Beef & Duck with absolutely no fillers, ensuring only the best protein is used. Every tin of EdgardCooper Beef & Duck Grain Free Wet Adult Dog Food is bursting with tasty veggies, fruit and botanicals, giving your pooch all the vitamins, minerals and antioxidants they need to keep healthy from nose to tail. This grain free recipe is gluten free and contains natural prebiotics so it is good for sensitive tummies.